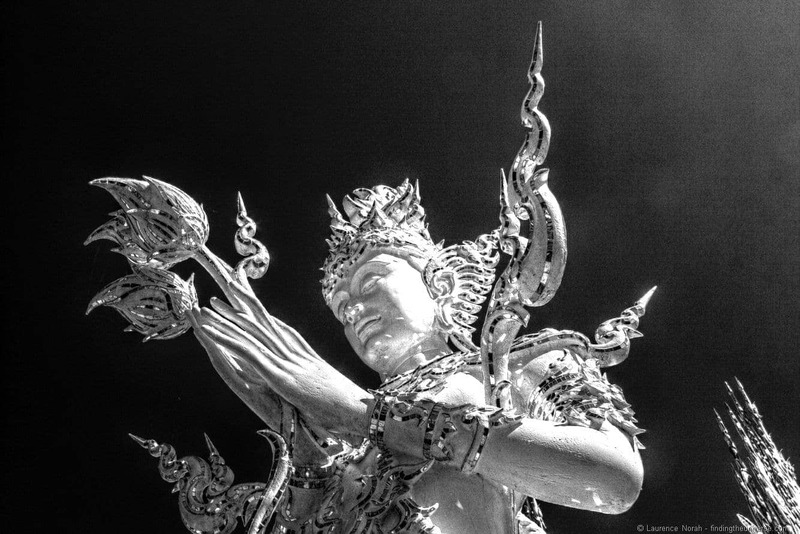 If you visit the northern city of Chiang Rai in Thailand, then I can highly recommend a trip to the white temple and the black temple, the former of which is the subject of today’s post, and the latter of which I posted about here. 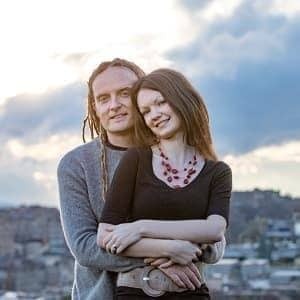 I won’t be surprised if you start looking for cheap airfare after you look at the pictures, even if it’s just to visit the Temples. They are that amazing! 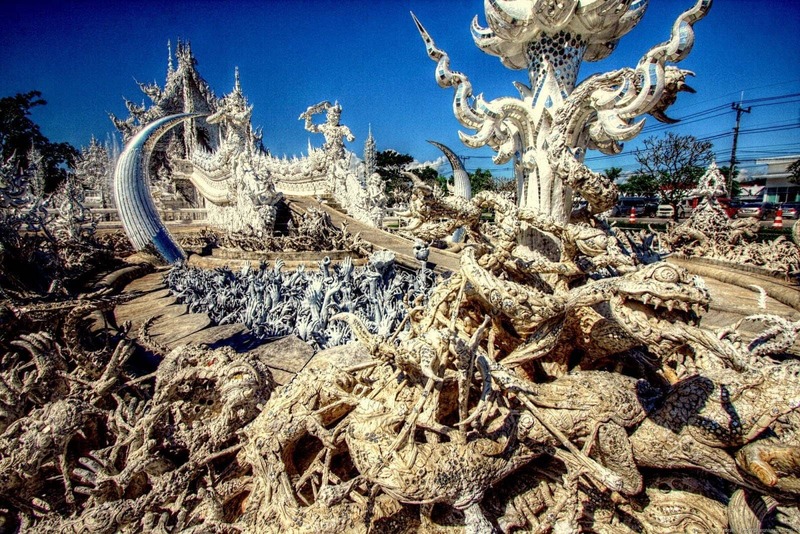 The white temple, or Wat Rong Khun as it is more properly known, is a deeply weird construction, reminiscent of something that Gaudi might have thrown together. 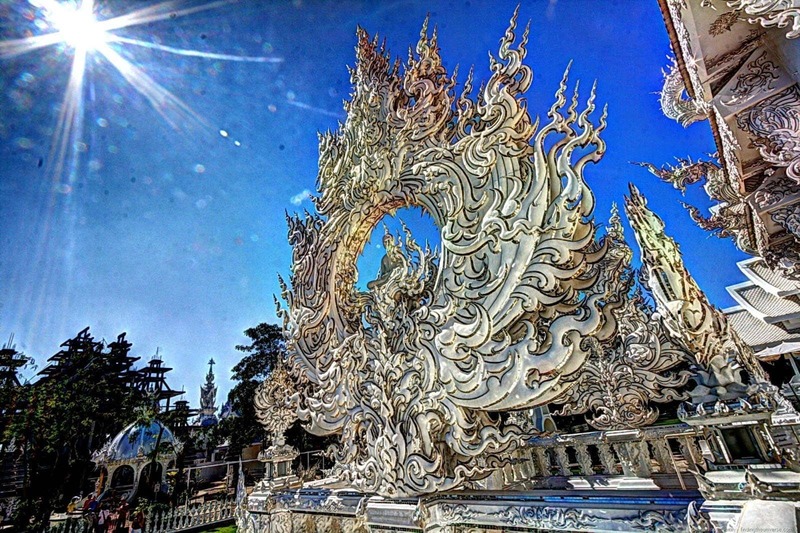 Were Gaudi alive in the present day and building temples in Thailand that is. 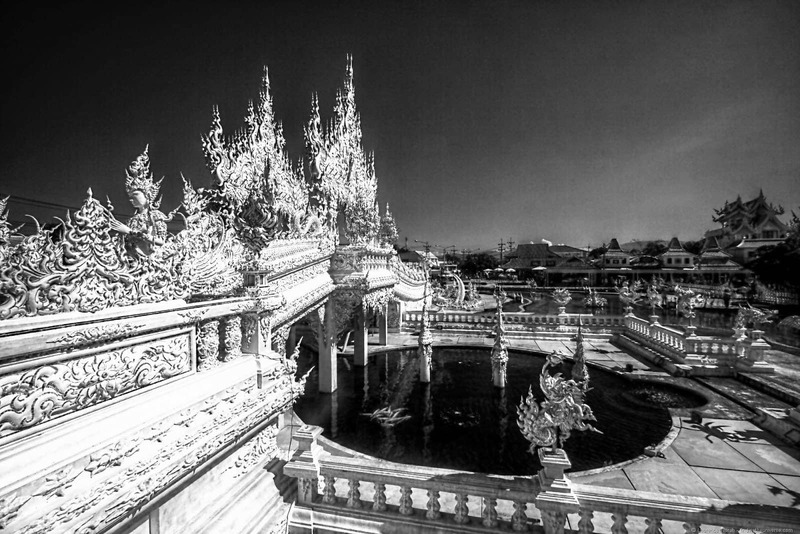 It is the work of the Thai artist Chalermchai Kositpipat, who for a long time had a style that wasn’t generally accepted as being art. 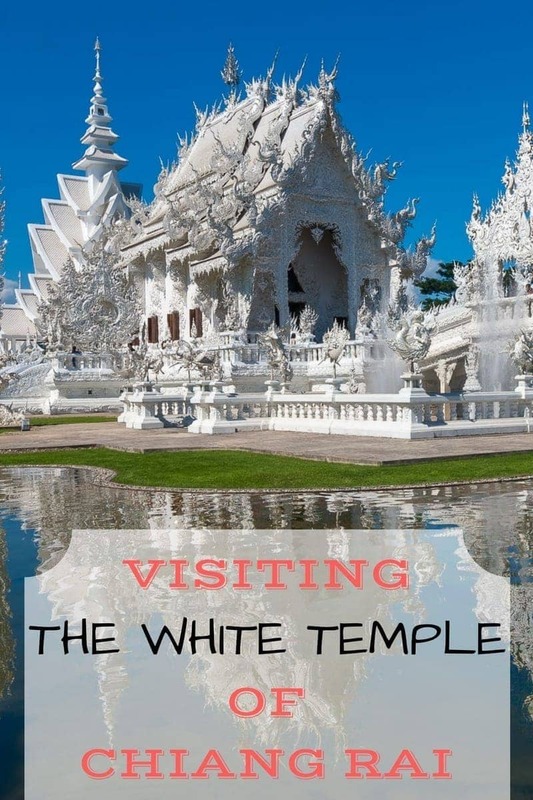 These days his works are more favourably looked upon, and the white temple is certainly a busy spot to visit. 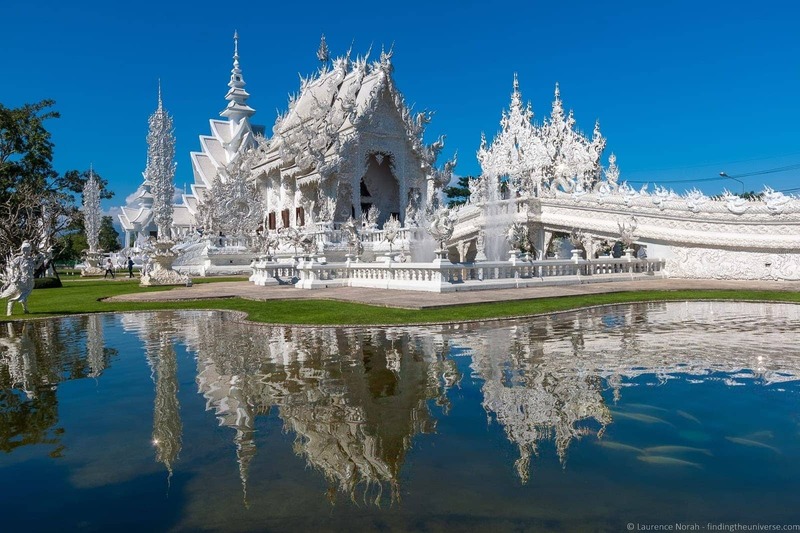 It’s totally worth it though – the incredible whiteness of the place shining like a blinding hospital corridor against your retinas, helped along by the millions of tiny mirrors that stud nearly every available surface. On a sunny day, it’s a bit like I imagine visiting heaven would probably be like. Or watching a temple themed nuclear explosion. 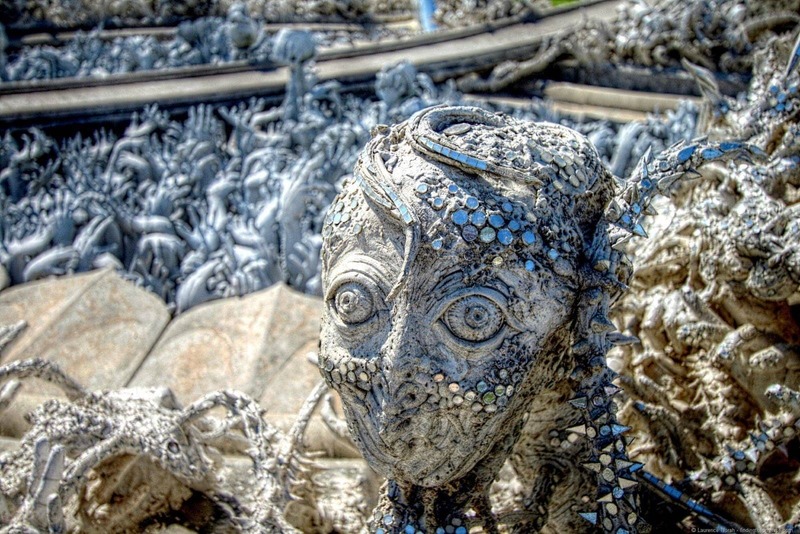 Along with the buildings, there is no shortage of deeply weird sculptures, and, drawing another parallel with Gaudi, the temple isn’t exactly finished yet. Although there is more than enough to explore still, including the incredible interior – which you are not allowed to photograph. Let’s just say religious murals in Thailand have never looked quite this contemporary. 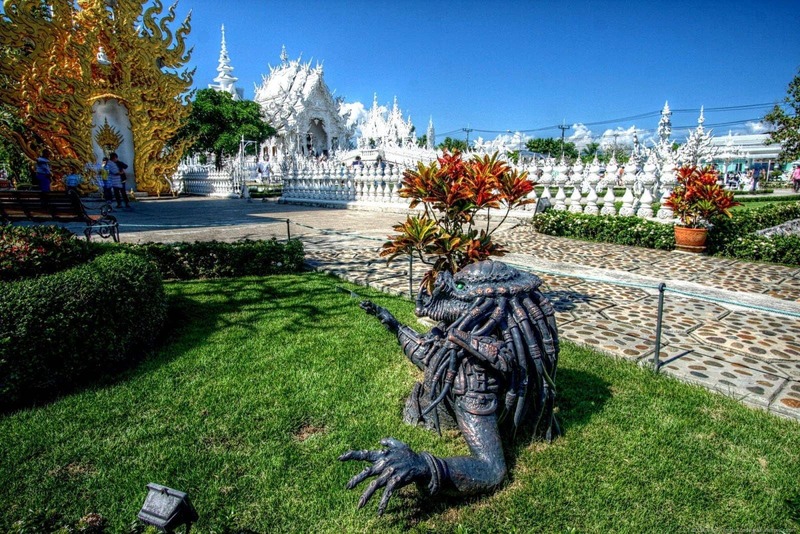 And now… it’s time to take a photo tour around the White Temple, so you can get an idea of the weirdness for yourself! It’s not just a temple. Oh no. There’s the odd sculpture or two as well. From a pit of hands, to tortured looking skeletons, there is plenty here to send your brain into a darkened corner for quite some time. The main bridge to the temple, after the sea of hands. Everything is incredibly ornate and beautifully put together. And sparkly. Did I mention the sparkly yet? White is a recurring theme. 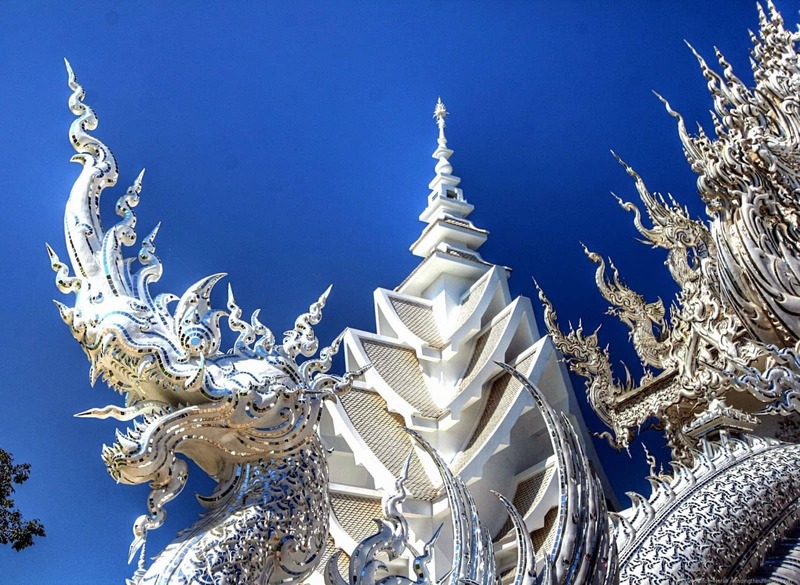 Two dragons guard the exit of the temple. White dragons, no less. I said it wasn’t finished. But somehow even the unfinished bits are really cool. And sparkly. Popular culture references are pervasive, even outside of the murals in the temple itself. Here a predator bursts out of the ground. I have no idea why. 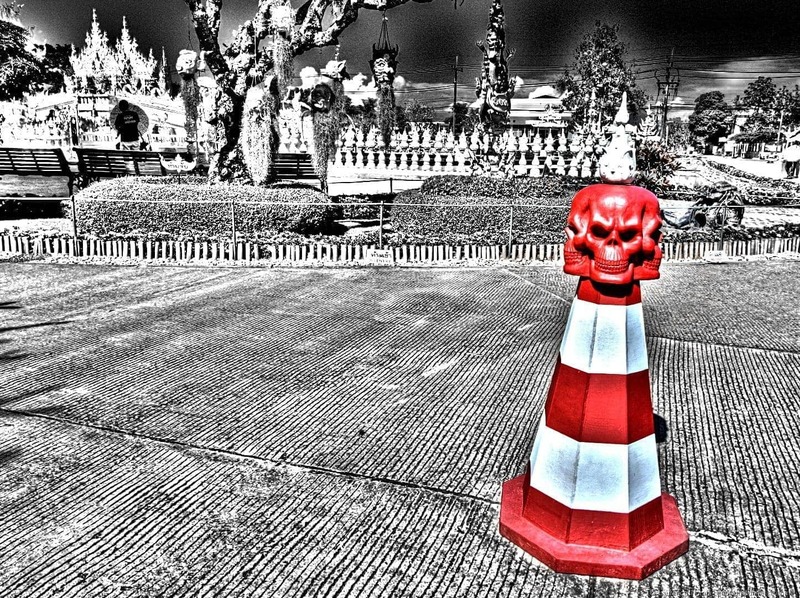 Not your average traffic cone. Side on to the temple, with the dragon guardians on the exit stairway. It’s kind of a miracle there’s no-one in these pictures. 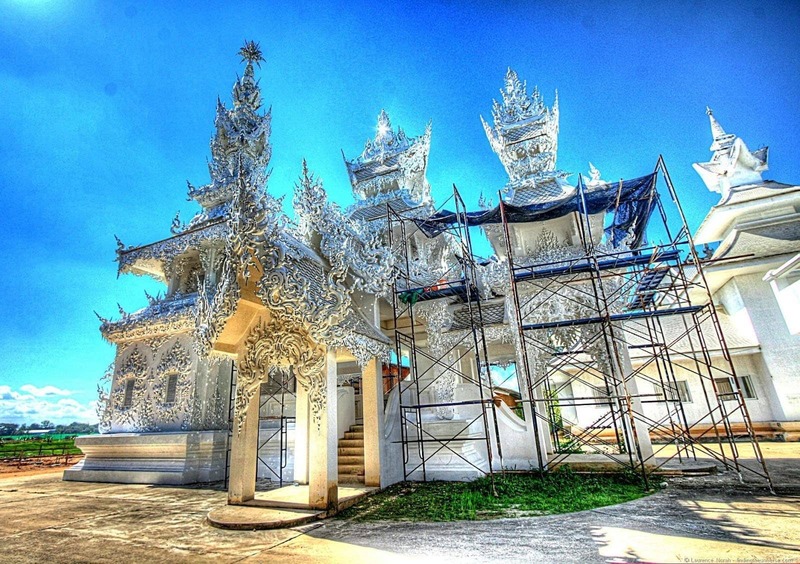 If you want to visit the White Temple when you’re in Chiang Rai, you’ll find it about 13 kilometres outside the city. You can reach it via public bus, which takes around half an hour, from the bus station, or of course by taxi / other standard Thai transport options. 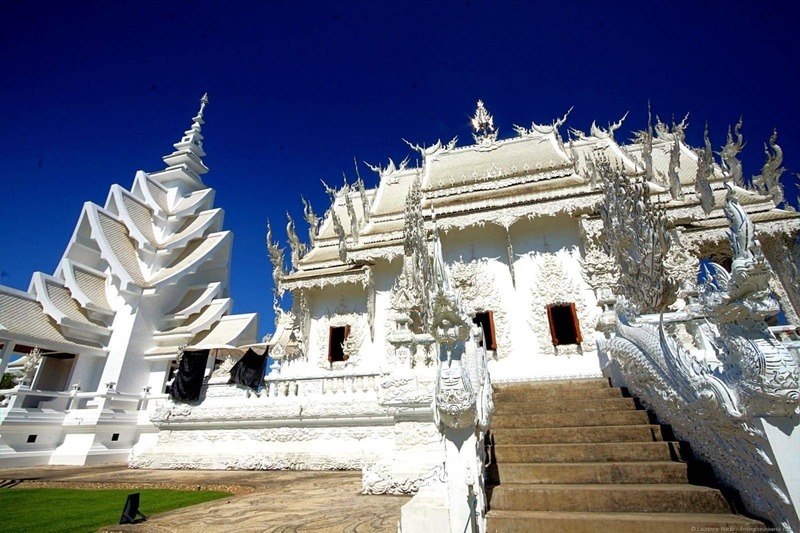 For more information on getting here, check out the wikitravel guide to Chiang Rai.